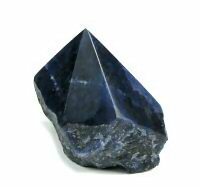 Sodalite standing semi polished point crystal eliminates fear and guilt better than any other stone. It also clears up mental confusion and reestablishes inner peace. Sodalite is also good for intuition, cleansing, healing, courage, endurance and meditation. It is a stone that is good for healing breaches in communication. It is a stone of truth, and brings this to all communications. It can help end arguments or other disagreements and is good for healing rifts in partnerships and relationships. It is particularly useful for honesty of emotions. Sodalite is a stone of logic, rationality, and efficiency. It is helpful for work in groups and stimulates thought. It increases intelligence, knowledge and learning, and can unite the logical with the spiritual. Sodalite strengthens the power of mind over body and bridges the gap between your thoughts and your feelings. Fosters knowledge, learning proficiency, consciousness, communication and wisdom. It also help free us from old behavior patterns that no longer serve us. Physically it is beneficial for the glands, digestive system, relieving insomnia, and decreasing calcium deficiency. It can also be useful for quicker healing of head colds. Sodalite is associated with the throat and 3rd eye chakras.